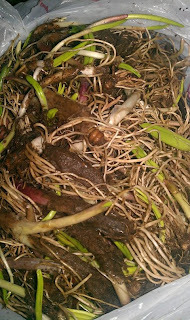 If you've been a long time reader of this blog, you know that spring in West Virginia means one thing in my household, ramps. I am lucky that my in-laws live in an area where ramps are abundant and every spring my mother-in-law brings me pounds of ramps to clean and cook. In case you are new to this blog and are completely unaware of what ramps look like here is a picture of an uncleaned early ramp. I always receive early ramps which are very different from late season ramps which have large green leaves. Early ramps have a much stronger flavor and are my favorite to cook with. 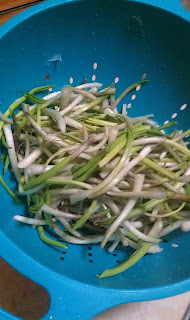 Here is a picture of how the ramps appear all cleaned up and ready to cook with. 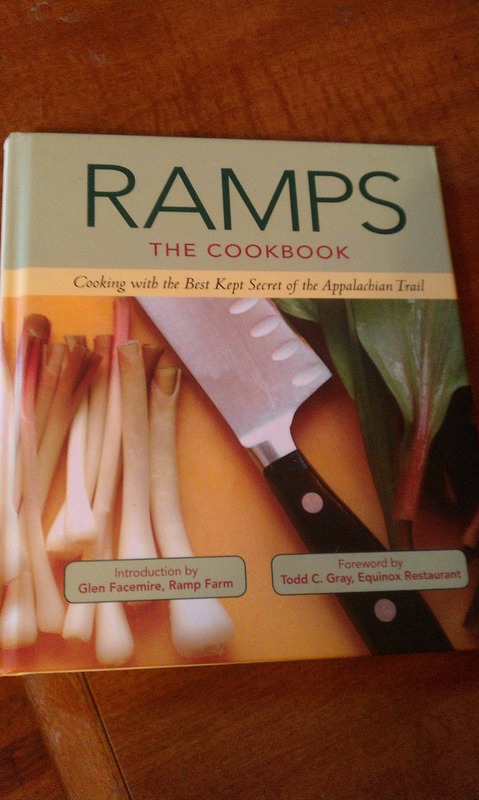 Given my love of all things ramps I was excited when I received a copy of a new cookbook to review, "Ramps The Cookbook: Cooking with the Best Kept Secrets of the Appalachian Trial" published by St. Lynn's Press. Finding ramps recipes is often times difficult and being able to find them all together in one cookbook is a great idea. This cookbook is very well organized and includes recipes and pictures from a number of my favorite food blogs. One of the things that I enjoyed the most about this cookbook is that it has a very well written introduction that includes photos and a general description of what exactly is a ramp. I have received so many questions asking me to explain what a ramp is since the reader had never seen them before and having this introduction is a great resource for novice ramp cooks. The main part of the cookbook, the recipes, are broken into sections: sides and main dishes, salads and soups, ramps and eggs, biscuits and muffins, sauces, dips, etc., juice and jam and year-round ramps. I really like that there are so many recipes and that they are broken into easy to navigate sections. Since I had early ramps I chose to review the recipe for Sweet and Sour Ramps. Clean the ramps and remove the leaves or green parts (use them for another recipe). Saute the ramps in olive oil over medium-high heat until they brown, about 5 minutes. Add vinegar and honey and swirl to combine in the pan. Turn the heat down and simmer until the liquid reduces to a glaze, about another 3-5 minutes. Serve hot or at room temperature with black pepper to taste. 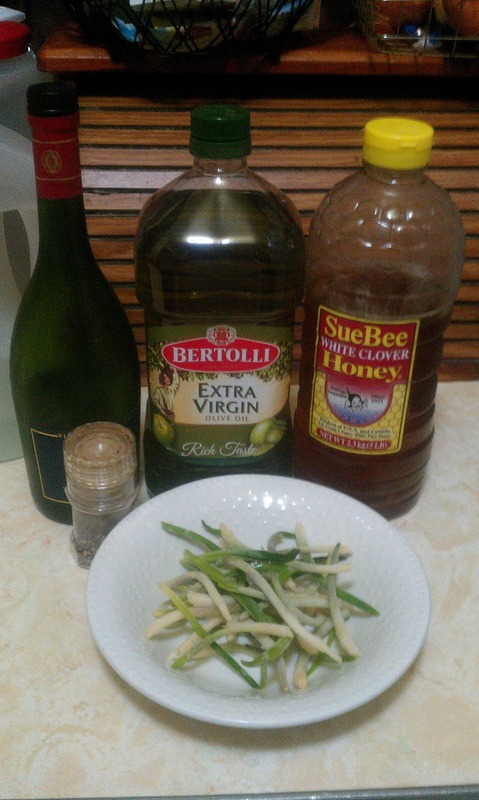 With five ingredients this is a very simple recipe that allows the flavor of the ramps to shine through. It takes approximately 8 minutes of cooking. The prep time is hard to gauge since it would vary on how you purchased your ramps. I always receive my ramps uncleaned and it takes me around an hour to clean two pounds. Later season ramps are easier to clean since the shoots have turned into leaves. I have always found the shoots to be the hardest part to clean. I did modify the recipe slightly. I found that 3 tablespoons of olive oil was a little too much for the ramps that I had. Instead I used 1 tablespoon and the recipe worked perfectly. 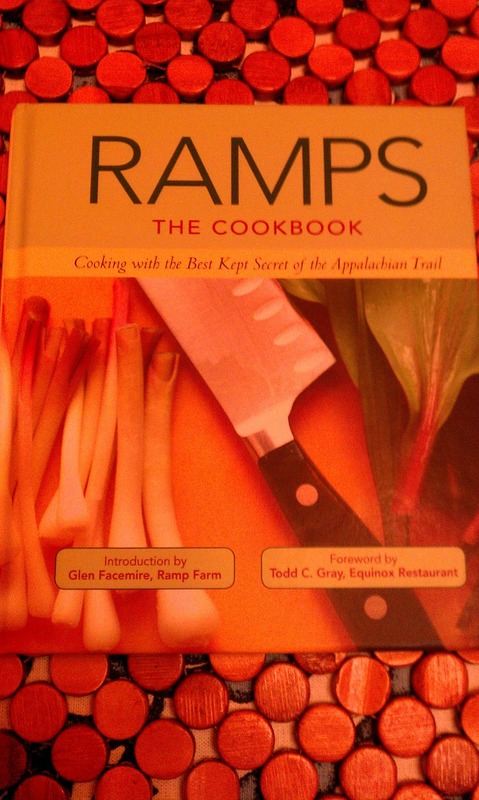 I love the idea of a whole cookbook based solely on ramps. Having everything in one book and well organized is a great resource. There are many more recipes that I plan to make in the future. I freeze my ramps after cleaning, so this will allow me new recipes all summer! This cookbook is a well put together collection and is something I could see being a great gift for cookbook (or ramp) lovers. The book can be purchased at your favorite book store or on Amazon or Barnes and Noble. Disclaimer: I received a promotional copy of this cookbook from St. Lynn's Press in order to facilitate this review, I received no further compensation for my post. The Sweet and Sour Ramps recipe is printed with permission from St. Lynn's Press. As always all opinions expressed are my own. Ramps sound very interesting. What did you serve with it? Was this the maindish? I normally serve ramps with pork or beef. 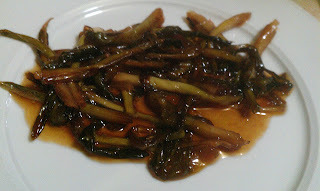 Ramps have a strong flavor, especially early ramps like I had so I prefer to serve them with red meat. For this recipe I served it as a side with pulled pork and they were delicious together! Very interesting and it looks so delicious! Thanks :) The recipe turned out well and it was beyond simple to make! Never heard of ramps. I'll have to investigate. Happy SITS day!